Movies are a big part of today’s entertainment experience. The latest blockbuster films are impressive to watch on the big screen, and even more fun to watch from the comfort of your own home. You may be considering adding a home theater to your house and are already imagining the Friday night movie parties you can have. It sounds like a great idea, but where do you begin? What Room Will You Use? You may already have an idea of where you want your home theater set up. It may be an unused room, the main living room of the house or you may be considering an addition. Wherever your theater set up will be, these tips will ensure you get maximum enjoyment. Square rooms are the least conducive to good sound quality. If possible, set your home theater up in a rectangular room. Position the screen on a short side wall, between the main speakers for maximum sound quality. Windows can adversely affect your home theater room in two ways. As a hard surface, the window increases sound distortion by reflecting sound back into the room. In addition, the light entering from a window can create reflections on the viewing screen. If possible, select a room with the least number of windows. If you can’t avoid having windows in your theater room, use light-blocking curtains such as blackout style drapes that fit snugly in the window jam. This will help reduce the amount of light that can sneak in and help to dampen any sound distortion from the glass. Are you worried about sound pollution – both in and out of the room? The type of walls your room has will make a difference in the quality and quantity of the sound. Before you start hot-gluing egg cartons on the wall to reduce noise, take a look around. Are your walls drywall? Drywall is an adequate material for your home theater room. Avoid adding framed artwork (the glass acts as a reflector), however. If your theater room will be in the basement or in a room with concrete block, you should consider adding drywall. If you prefer, sound absorption panels can be installed over the concrete. These panels are effective at controlling sound and can range in price from $4 to $20 per square foot. Other alternatives include using carpet squares or insulation panels. Particularly if your home theater will be used by kids, carpeting is one of the most effective floor coverings. The carpet (and the pad underneath) can absorb sound, as well as make a comfy spot for kids, teens and anyone else who may find themselves rolling on the floor in laughter. Avoid hardwoods and tile flooring, if possible. Dark colors work best for entertainment rooms. Bright colors reflect light, so use neutral colors and avoid using glossy finishes for best results. One of the most important components in a home theater system is the sound equipment. Technology today has advanced remarkably, giving homeowners options in quality (and expense) that were previously unheard of. Competition among manufacturers has helped to reduce costs and increase quality. Movies and TV shows have specifically designed sound effects that can come from specific areas of your listening equipment. A roaring jet taking off, for example, would sound as though it were moving from one side of the room to the other, thanks to strategically placed equipment. 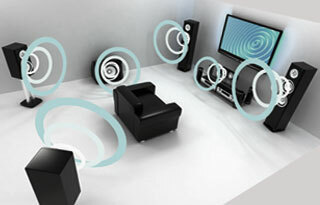 Typical home theater set ups feature 5.1 surround sound. This indicates that there are 5 speakers and 1 woofer. In most set ups, three of the speakers and the woofer face into the room from the front. The remaining two speakers face into the room from behind the viewer’s sitting area. You may need to move the speakers around the room to determine the best placement. The front speaker has the responsibility of bringing the sound directly to the viewer. It is essential that the sound be functioning properly from this speaker. Keeping the sound in sync with the movie is critical for movie enjoyment. You may need to adjust the location of the center speaker, until you are satisfied that the sound seems to be coming from the screen. Adjust the sound coming from the two side speakers. They are often on towers and can be placed on either side of your screen. They should enhance the sound, but not over power the center speaker. The woofer brings the bass to the room, and is often the most noticeable sound element. The low bass tones from this speaker will resonate in the entire room. This means the position is less important but should still be managed to ensure the whole room can hear and appreciate the bass. 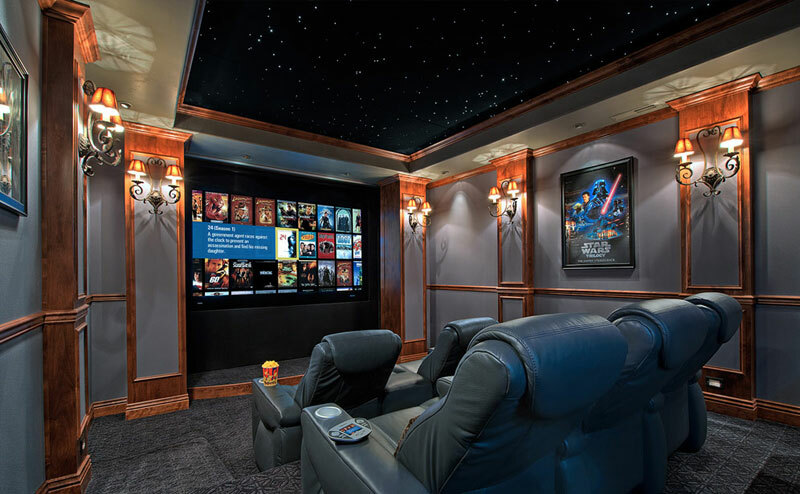 With advancing technology, movie rooms have become audio-visual playgrounds. Homeowners are adding elements such as 3-D and 4-D viewing, as well as Blu-Ray and streaming capabilities. 3-D content is widely available in games, movies, and TV shows. Readily available, inexpensive 3-D glasses make it possible for everyone to enjoy the added movie effects. Virtual Reality experiences are becoming standard for home entertainment, so adding streaming and other sources for VR is expected. Multi-player games are gaining in popularity. Creating an environment where teens and young adults can share in the experience together takes the home theater system to a whole other level. This may require gaming systems with multiple hook-ups, boosted wireless signal or a dedicated gaming signal to allow for maximum play. Adding a home theater system can be exciting. There are dozens of options that promise a theater quality experience at your home and it is easy to become overwhelmed. Interested in finding out which setup would be best for your home theater system? Clarion AV can help you determine what meets the entertainment needs of your family, and which system would be best for you. Call Clarion AV at (972) 861-2802 to schedule a consultation today!